Now began the regular practice of presenting public performances each Spring which would expand the repertoire of the Society and give an opportunity to the growing membership to take part in large-scale choral works. The first of these was Handel's 'Messiah', given in St. Mary's Church in March, 1965. The performance was, in the event, a considerable success, though there had been anxious moments concerning the interest and support of the public. Relatively few tickets had been sold prior to the day and a really bad thunder storm just before the start raised doubts as to whether anyone would come in 'on the door'. Then the audience arrived in droves and every available seat, including those in the side chapels, was taken. 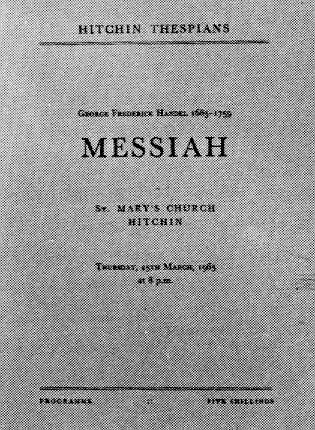 An estimated 800-900 people heard the Society's first Messiah' - a figure no longer possible, sadly, under the terms of the new licence. In November came an unprecedented and literal departure when, for the very first time, the Thespians moved from Hitchin for their major production. 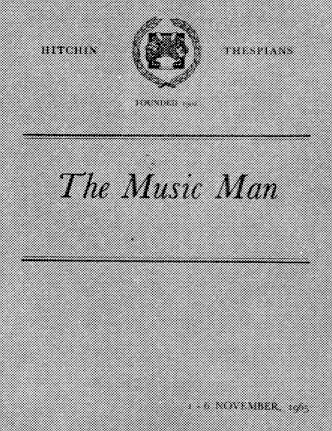 Alterations were being made to the Town Hall and, with the possibility that the work there would not be finished by November, the Society accepted the kind offer by St. Francis Theatre to accommodate the autumn show, 'The Music Man'. Accommodation, however, had not been the only problem. Owing to the indisposition of the original producer which prevented his attending floor rehearsals, it became necessary to find a substitute at very short notice. There had been serious doubts as to whether or not the Thespian audiences would take kindly to the move to St. Francis. The larger stage and fly-tower there meant that better productions could be given, while the raked seating afforded patrons a better view. 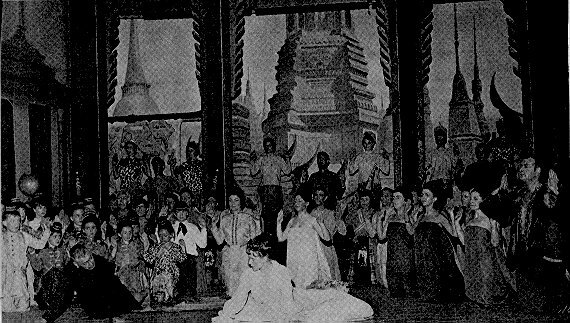 Encouraged by the support given to 'The Music Man', however, it was decided to remain at Letchworth for the 1966 production, 'The King and I'. 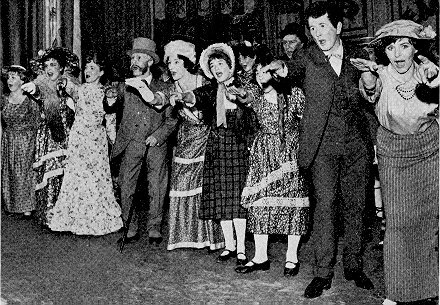 Meanwhile, the Thespians had presented their second 'Trial by Jury', together with Coleridge Taylor's 'Hiawatha's Wedding Feast' at Hitchin College of Further Education in March, 1966. Despite acoustic difficulties, the programme was enjoyed by the performers and well received by the audience. Any reservations about the wisdom of staging 'The King and I' at St. Francis were swept away by the public response. The show was the first complete sell-out for some time. All seats were sold ten days before the opening and even the waiting list for tickets had to be closed when it reached 130. If it was a triumph for the Society as a whole, it was even more so for Geoffrey Oxiey, the new producer, who had played one of the principal roles in the previous year's production. Mr Oxiey, like Peter Cooper, was on the staff of Hitchin Boys' Grammar School where he was a teacher of English. At twenty-eight, he was the youngest producer to date and the first man to fill the post for forty years. The Company knew 'The King and I' as 'the show of the crinolines'. These were so wide that the 'wives' could not negotiate the steps from the dressing-rooms to the stage, so the hoops and skirts had to be brought up separately and the 'wives' dressed on the stage. 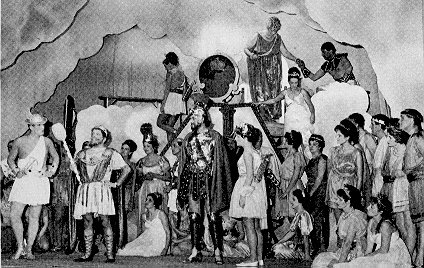 In April, 1967, the Thespians returned to Hitchin Town Hall, where, on two nights, they presented a concert version of Gounod's opera, 'Faust', performed by a choir of eighty and an orchestra of twenty-eight. The critics found 'Faust' very much to their liking as, indeed, did the audience.